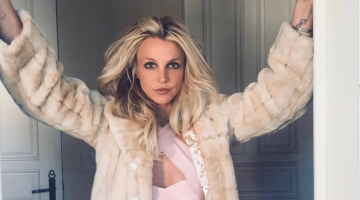 Britney unveiled the video for I Wanna Go late last night and it finds the 29-year-old pop icon in a distinctly naughty mood. Directed by Chris Marrs Piliero, who recently helmed Ke$ha’s well-received Blow video, brings out Brit’s mischievous side in the amusing clip. It begins with the diva answering questions at a press conference but she before too long she begins daydreaming about the things she’d rather be doing. Like hitting reporters with a microphone, flashing policemen and groping her cute fans. There are also nods to movies like The Terminator, Half Baked, Britney’s own Crossroads and even Avril Lavigne’s old music videos. Check out the clip for the third single from Femme Fatale (below) and let us know what you think.